What is it like for that young person from Long Island, Exuma or even Grand Bahama relocating to New Providence to attend the University of The Bahamas? For decades, many young people from throughout the archipelago have migrated to Nassau leaving behind their safety net in pursuit of tertiary education. Nikell Johnson, a native of Long Island shares her experience of coming to Nassau in 2007 as an impressionable and somewhat oblivious teenager to embark on a journey that would shape and change her future. Who or what influences the career path we choose? In many instances, our career paths are influenced by what we have been exposed to directly or indirectly. The children of the late Dr. Keva M. Bethel were undoubtedly influenced by their mother as both are university professors. Dr. Edward Bethel and Dr. Nicolette Bethel share their memories of their mother as president of COB and we explore the importance of research and the attainment of a PH.D as a viable pursuit for this generation and the next. Continuing education and lifelong learning is one of the vital avenues to extend access to tertiary education. There is a growing focus on personal and professional development, online learning and academic enhancement. The Dean of Continuing Education and Lifelong Learning (CELEARN) Dr. Tyler Adams and the Director of CELEARN Dr. Lorraine Bastian-Jones are our guests on this episode. The episode features part-time faculty JoAnn Callender as a “Warrior Queen” and showcases how UB is contributing to resilience in the performing arts. It also features the story of UB Hall of Fame Inductee Delton Bain, a 1978 graduate. Success is evident in different ways. The institution’s athletics programme has achieved incremental successes and is still pursuing loftier goals. 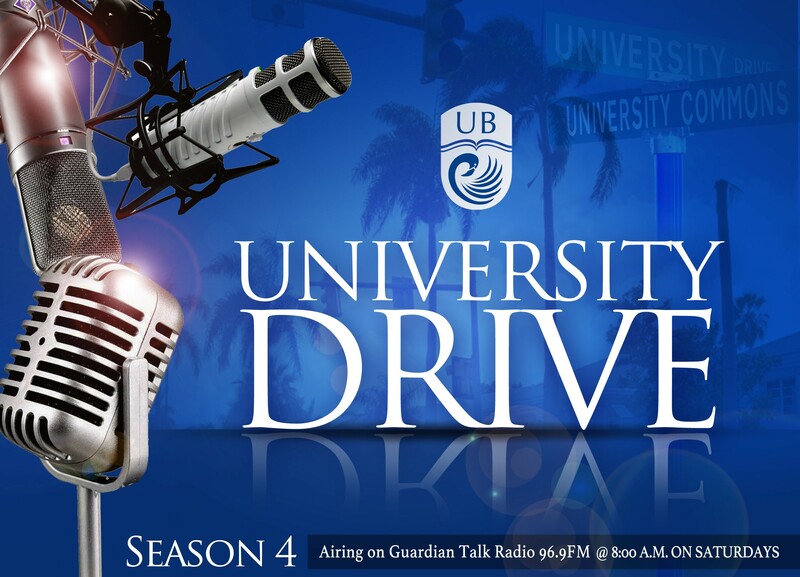 University Athletics Director Kimberley Rolle; Mingoes athletics first full-time coach Ednal Rolle (track and field and cross country), Men”s Soccer Coach Dion Godet; Men’s Soccer Team Captain Julio Jemison; and national heptathlete record-holder Ken Mullings are the guests on the first episode of University Drive season 4. Listen to them reveal their motivations and aspirations for UB Mingoes Athletics. Assistant Professor of Architecture Henry Hepburn and architecture students Helson Ambrose and Donovan Knowles explain the process underway for the creation of a Master Plan for University of The Bahamas-North in Grand Bahama to expand across a 200-acre expanse of land. Students enrolled in the Design Studio III class are developing two schemes for the phased development of the campus. The process started with the Design Studio II class which completed the research for an envisioned Master Plan. The art of story-telling has been an intrinsic part of the Bahamian experience. Over time, conversations have been used as ways to share experiences, transmit culture and preserve history. Dr. Tracey Thompson, Director of “From Dat Time”: The Oral & Public History Institute (FDT) at UB shares insights on the work of FTD and the art of capturing and documenting oral history. The world is feeling the effects of climate change, particularly small island developing states like The Bahamas which face the vulnerabilities of coastal erosion and forestry degradation. Assistant Professor at UB and Visiting Researcher Dr. Adelle Thomas, a Human-Environment Geographer, and Mr. Christopher Russell, Director of Forestry, discuss the sustainability measures that The Bahamas must implement to mitigate the effects of climate change and protect the archipelago. The Government and Public Policy Institute (GPPI) at UB is intended to play a leading role in matters of public policy development and sustainability. Executive Director and Senior Policy Fellow Mr. Zhivargo Laing discusses how the Institute plans to shape the research, design and implementation of public policy in The Bahamas and internationally. UB Alumnus and Vice President of the UB-North campus in Grand Bahama Dr. Ian G. Strachan provides the context for the academic, operational and infrastructural priorities of the campus. He also shares his experiences as a student of the College of The Bahamas and hopes for the development of a robust University that prepares students for a global society. A university education is more than the learning that one receives in classrooms or labs. It is also made up of those opportunities for international experiences. As UB has grown and developed, global studies is increasingly important, as important as exposing students from abroad to the offerings of UB. Dr. Jacob Dyer-Spiegel, Director of Global Studies and Programmes and Samia Thompson, Psychology major and Emerging Leaders in the Americas scholar join us. Delivering tertiary education to students throughout the archipelago directly impacts UB’s mission of supporting and driving national development. The University system is a natural environment for lifelong friendships and memorable social interactions. Family island natives Alexis Lightbourne, an architecture major, and Ryan Rolle, an education major, discuss how their national and international UB experiences have led them to become leaders in their own right. Academic affairs is the lifeblood of a University, feeding not only education and research but also other scholarly pursuits that reflect the rigours of higher learning. The landscape that UB is shaping is as unique as the archipelago that provides the environment in which it operates. UB Provost Dr Linda Davis and Dean of Graduate Studies and Research Dr. Vikneswaran Nair discuss the strategies for developing graduate education, online learning and an inclusive governance structure. The life of a University of The Bahamas (UB) student is no bed of roses. The demands and expectations of higher education are intense. So imagine adding to that the onerous responsibilities of being an elected public official. Such is the life of the Member of Parliament for Bain and Grants Town Hon. Travis Robinson. The tourism management major at UB shares his story of triumph over adversity and breaking barriers as a guest on University Drive. The fees levied by financial institutions has become a hot button issue for Bahamian consumers as competition increases for banking clients. Why are these fees charged and how they are affecting consumers? Guests Algernon Cargill, adjunct faculty, and Bannerman Campbell, UB student, answer these and other burning questions. Plus, find out how The Bahamas, Haiti and China intersect in the alumnus spotlight on Williamson Gustave. Building character is essential to the mission of University of The Bahamas. But what does this mean and how does this impact the student experience? UB President Dr. Rodney D. Smith shares the vision and how it is being realized. This episode also includes a feature focus on “UB Moving Forward”. UB researchers have collected data from the population of the Bahamas Department of Corrections and an analysis of the information reveals some intriguing details about educational attainment and crime and illegal drugs in the lives of sentenced inmates. Can this information be used to impact crime and violence in the country? Researchers Dr. Pandora Johnson and Mr. William Fielding tell us. Also, a candid conversation with alumna Deandrea Hamilton gives us a glimpse into the life of a determined entrepreneur.